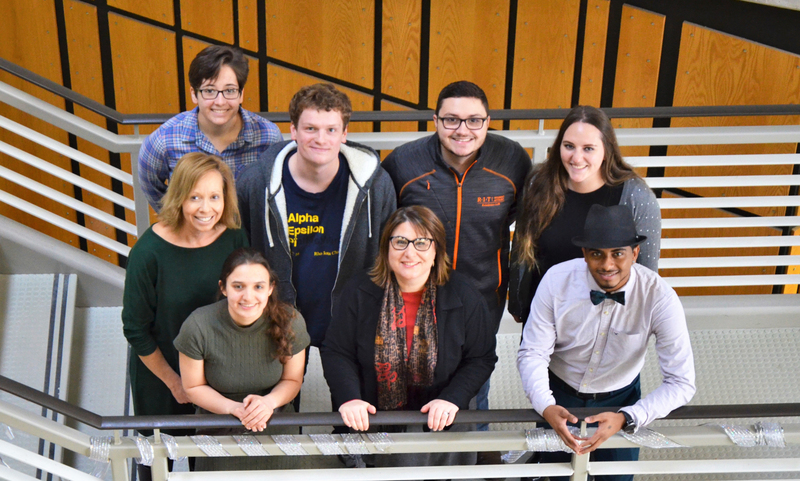 The Molecular Biology Education Research (MBER) Group is a collaborative research lab co-led by Dr. Dina Newman and Dr. Kate Wright, faculty in the Gosnell School of Life Sciences at RIT. The team studies how students think about molecular biology concepts and develops tools for improving biology education. Student mental models of molecular processes that involve DNA, and how novices differ from experts. Much of our work has focused on student understanding of meiosis, which led to the development of a new framework, The DNA Triangle. How visual representations of molecular processes impact student understanding. Work thus far has focused on the use of arrow symbols by experts and the interpretation of these symbols by learners. We are currently developing a framework that combines elements of visual communication with evidence-based pedagogy. How physical models can be used to improve student learning about molecular processes. This work is done in collaboration with the Center for Biomolecular Modeling at the Milwaukee School of Engineering (http://cbm.msoe.edu/), where many 3-D models have been developed. These models provide the basis for activities that promote deep conceptual learning of processes that are not easy to observe directly. Development of assessments and activities for undergraduate instructors teaching molecular biology concepts. 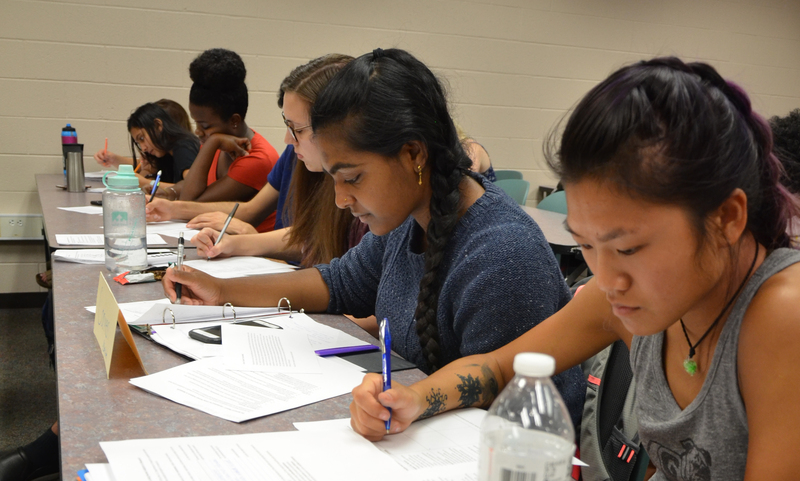 Based on our investigations of student thinking about biology, we have developed numerous activities that demonstrably improve learning for undergraduates at all levels. We have also created the Central Dogma Concept Inventory (CDCI), which can be used to assess student understanding of Central Dogma processes. Interactive video vignettes for teaching key ideas that are difficult for students. Together with Dr. Robert Teese (School of Physics and Astronomy at RIT) and Dr. Jean Cardinale (Alfred University), we have developed a suite of interactive, web-based activities that can be used to introduce or clarify key concepts and big ideas in biology (https://www.rit.edu/cos/interactive/). This project is funded by NSF (DUE-1432286, DUE-1432303). Undergraduate research. In addition to mentoring RIT undergraduates on research projects during the academic year in the MBER lab, Drs. 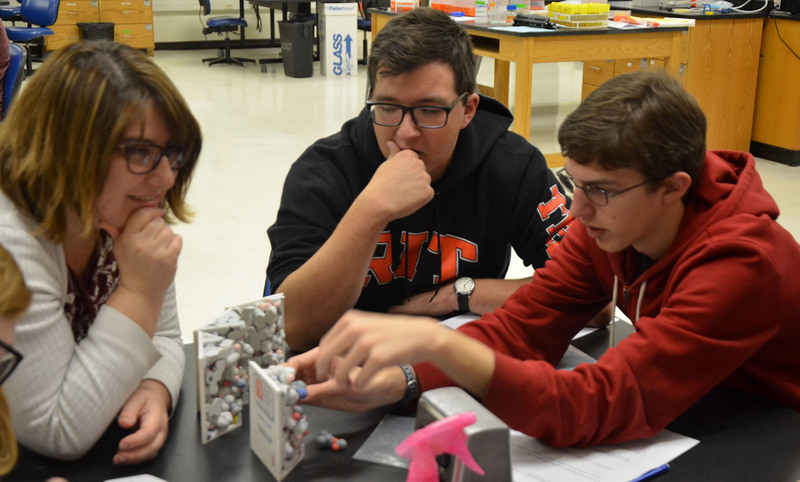 Wright and Newman lead an NSF-funded summer REU program (DUE-1359262) that brings students from all over the U.S. to learn about Discipline-Based Undergraduate Research and undertake cutting edge projects in the field (https://www.rit.edu/science/smerc/reu). Wright LK, Cardenas JJ, Liang P, Newman DL (2018). Arrows in Biology: Lack of Clarity and Consistency Points to Confusion for Learners. CBE-Life Sci Educ. 17(1):ar6. doi: 10.1187/cbe.17-04-0069. Wright LK* Newman DL*, Catavero CM (2017). The DNA Triangle and its Application to Learning Meiosis. Submitted to CBE-Life Sci Educ. 16(3):ar50; doi:10.1187/cbe.17-03-0046. *These authors contributed equally. Wright LK, Newman DL, Cardinale J, Teese R (2016). Online Interactive Video Vignettes Create a Personalized Active Learning Classroom for Introducing Big Ideas in Introductory Biology. Bioscene 42(2):32-43. Wright LK, Zyto S, Karger DR, Newman DL (2013). Online Reading Informs Classroom Instruction and Promotes Collaborative Learning. J Coll Sci Teach. 43(2):44-53. Newman DL and Wright LK (July, 2018). How to Get More Out of Conceptual Assessments. Society for the Advancement of Biology Education Research 8th Annual Meeting. Minneapolis, MN. Wright LK and Newman DL (July, 2018). 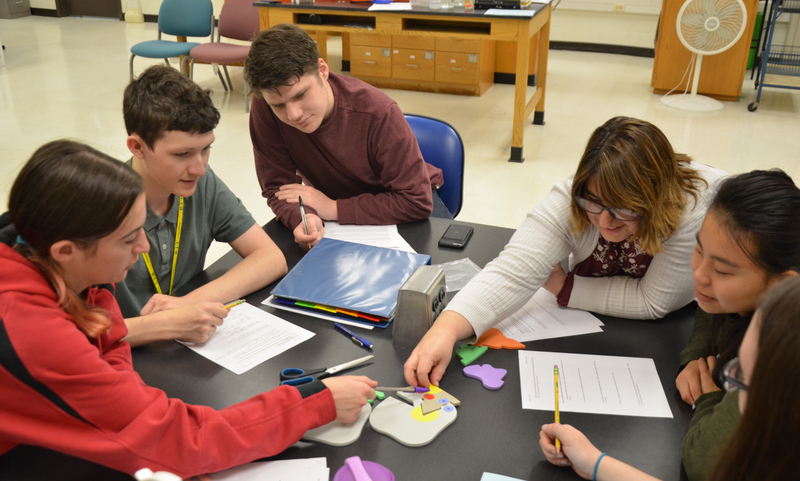 High school teacher conceptions and lessons about meiosis reveal a critical gap in the biology curriculum. Society for the Advancement of Biology Education Research 8th Annual Meeting. Minneapolis, MN. Newman DL (May, 2017) Interactive Vido Vignettes in Biology: Designed to Teach Experimentation as well as Conceptual Material. ACE-Bio Research Coordination Network Annual Meeting, Highlands, NC. Cardenas JJ, Newman DL, Wright LK (November 2016) Biology Figures Miss the Point of Arrow Usage. Rochester Academy of Sciences, Rochester, NY. L. Kate Wright. Development and Application of the Central Dogma Concept Inventory (CDCI) Tool. University of South Florida, Center for Improvement of Teaching and Research in Undergraduate STEM Education (CITRUS) seminar. Wednesday Oct. 14, 2015. Newman DL, Wright LK. "Modeling in the Introductory Biology Laboratory." CREST Assessment Workshop, Milwaukee, WI (June, 2014). Newman DL, Dy GEC, Jan M, Wright LK (October, 2018). How is Meiosis Taught in High School? A Critical Gap for Students. American Society of Human Genetics Annual Meeting. San Diego, CA. Dy GEC, Wright LK, and Newman DL (July, 2018). Visual Representations of Meiosis in Biology Textbooks Fail to Provide Important Conceptual Information. Society for the Advancement of Biology Education Research 8th Annual Meeting. Minneapolis, MN. Stefkovich M, Clasen C, Wright LK, Newman DL (July, 2017) 3-D Physical Model-based Activities Benefit Student Learning in Multiple Ways. 7th Annual Meeting of the Society for the Advancement of Biology Education Research, Minneapolis, MN. Wright LK, Newman DL (July, 2017) Exploration of the DNA Triangle and its Application to Learning Molecular Biology. 7th Annual Meeting of the Society for the Advancement of Biology Education Research, Minneapolis, MN. Newman DL, Wright LK (July, 2017) Supporting Inclusivity and Improving Learning with Activities that Incorporate Physical Models of Molecular Biology Processes. Gordon Research Conference on Undergraduate Biology Education Research, Easton, MA. Cardinale JA, Newman DL, Wright LK, Teese R (July, 2017) Interactive Video Vignettes: Out-of-class primers that allow personalized active learning for all students. Gordon Research Conference on Undergraduate Biology Education Research, Easton, MA. Adair A, Donahue C, Newman DL, Wright LK (November, 2016) Creating a New Model for PCR Instruction. Rochester Academy of Sciences, Rochester, NY. Cardenas JJ, Wright LK, Newman DL (July, 2016) Arrows in Biology Drawings: Missing the Point of the Figure. 6th Annual Meeting of the Society for the Advancement of Biology Education Research, Minneapolis, MN. Wright LK and Newman DL (July, 2016) Development of a new Theoretical Framework and its application to learning Meiosis. 6th Annual Meeting of the Society for the Advancement of Biology Education Research, Minneapolis, MN. Wright LK, Newman DL, Lewis K, Snyder C, Fisk JN (July, 2016) Development of the CDCI-SHiNE Web Application for analysis of data generated by a Multiple Select Assessment Instrument. 6thAnnual Meeting of the Society for the Advancement of Biology Education Research, Minneapolis, MN. Cardinale J, Newman DL, Wright LK, Teese R (July, 2016) The effectiveness of Interactive Video Vignettes as tools for teaching and for insight into student thinking. 6th Annual Meeting of the Society for the Advancement of Biology Education Research, Minneapolis, MN. Newman DL, Wright LK, Jasmi JM, Cardinale J, Teese R (April, 2016) Interactive Video Vignettes: a Tool for Teaching and Insight into Student Thinking. Envisioning the Future of Undergraduate STEM Education (EnFUSE): Research and Practice. Washington, D.C.
Cardinale JA, Osborne A, Kovach M, Kennedy-Trumbull M, Schramm L, Newman D, Wright LK, Teese R (April, 2016) The effectiveness of Interactive Video Vignettes to address introductory students’ common biological misconceptions and promote learning of core biology concepts. Envisioning the Future of Undergraduate STEM Education (EnFUSE): Research and Practice. Washington, D.C.
DeOca K, Wright LK, and Newman DL (April, 2016) DNA Sequence is the Key to Understanding Meiosis, presented at the National Council on Undergraduate Research 30th Annual Meeting, Asheville, NC. DeOca K, Wright LK, and Newman DL (March, 2016) DNA Sequence is the Key to Understanding Meiosis, presented at the Association of Southeastern Biologists, Concord, NC. Cardenas J, Lu A, Wright LK, Newman DL (November, 2015) Arrows, Arrows, Everywhere in Biology Drawings. Rochester Academy of Science Fall Paper Session, Canandaigua, NY. Jasmi JM, Cardinale J, Teese R, Wright LK, Newman DL (November, 2015) Evidence of Student Learning with Interactive Video Vignettes in Biology. Rochester Academy of Science Fall Paper Session, Canandaigua, NY. Fisk NJ, Snyder C, Newman DL, Wright LK (November, 2015) Development of CDCI-SHiNE, An R-Based Web Application for the Analysis of Results from the Central Dogma Concept Inventory. Rochester Academy of Science Fall Paper Session, Canandaigua, NY. Newman DL, DeOca K, Catavero CM, Zajicek E, Wright LK (October, 2015) Teaching Meiosis Brings Together Concepts from Four Different Areas. American Society of Human Genetics Annual Meeting, Baltimore, MD. Cardinale JA, Wright LK, Newman DL, House C, Teese R. (September, 2015) The Effectiveness of Interactive Video Vignettes as New Media Resource to Maximize Student Learning of Biology Concepts. PKAL Upstate NY Regional Network Fall Meeting. Fredonia, NY. Newman DL, Cardenas J, Liang P, Taifor AF, Wright LK (July, 2015) Arrows in Biology Point to Confusion for Students. 5th Annual Meeting of the Society for the Advancement of Biology Education Research, Minneapolis, MN. Wright LK, Zwickl B, Newman DL (July, 2015) Getting a Jump-Start on the Summer DBER REU. 5th Annual Meeting of the Society for the Advancement of Biology Education Research, Minneapolis, MN. Newman DL, Fisk JN, Snyder C, Wright LK (July, 2014) Development of a Central Dogma Concept Inventory for Use at All Levels of Undergraduate Biology. 4th Annual Meeting of the Society for the Advancement of Biology Education Research, Minneapolis, MN. Wright LK, Fisk JN, Newman DL (July, 2014) Confusion surrounding the synthesis of macromolecules from building blocks: a crucial gap revealed. 4th Annual Meeting of the Society for the Advancement of Biology Education Research, Minneapolis, MN. Newman DL, Wright LK (April, 2014) Development of a Central Dogma Concept Inventory for Use at All Levels of Undergraduate Biology. PKAL Upstate NY Regional Network Spring Meeting, Rochester, NY. Newman DL, Skuse GR, Carter D, Pough FH, Wright LK (Nov, 2013). Lessons Learned from the First Year Implementation of a Two-Track, Reformed Introductory Biology Course. 2013 Biology Education Research Symposium, National Association of Biology Teachers Professional Development Conference, Atlanta, GA.
Newman DL, Wright LK, Teese R (Oct, 2013). Interactive Video Vignettes for Engagement in Learning Outside of the Classroom. PKAL Upstate NY Regional Network Fall Meeting. Alfred, NY. Newman DL, Wright LK, Teese R (July, 2013). Development and Testing of Interactive Video Vignettes in Biology. 3rd Annual Meeting of the Society for the Advancement of Biology Education Research, Minneapolis, MN. Wright LK, Fisk JN, Newman DL (July, 2013). DNA à RNA: Identification of New Misconceptions Related to the Central Dogma of Molecular Biology. 3rd Annual Meeting of the Society for the Advancement of Biology Education Research, Minneapolis, MN. Tobin B, Wright LK, Newman DL (Nov, 2012). Introductory Biology Textbook Representations of Genetic Phenomena May Foster Confusion. Rochester Academy of Science 39th Annual Fall Paper Session. Rochester, NY. Catavero CM, Wright LK, Newman DL (Nov, 2012). Meiosis Concepts in Undergraduate Education. Rochester Academy of Science 39th Annual Fall Paper Session. Rochester, NY. Newman DL, Catavero C, Wright LK (July, 2012). Why is Meiosis so Hard for Students to Learn? 2nd Annual Meeting of the Society for the Advancement of Biology Education Research. Minneapolis, MN. Wright LK, Zyto S, Karger D, Newman DL (July, 2012). Collaborative Reading Informs Classroom Instruction. 2nd Annual Meeting of the Society for the Advancement of Biology Education Research. Minneapolis, MN. Newman DL, Wright LK (June, 2012). The Power of Analogies: Get Your Students Thinking About Central Dogma! American Society of Microbiology Conference for Undergraduate Educators. San Mateo, CA. Wright LK, Fisk JN, Kim TD, Newman DL (June, 2012). Do you see what I see? Student use of classic biology representation. 2nd Conference on Transforming Research in Undergraduate STEM Education, St. Paul, MN. Pough H, Newman D, Houtman A, Skuse G, Wright K (May, 2012). Educating Scholars from Day One. RIT Faculty Institute on Teaching and Learning, Rochester, NY. Newman DL, Catavero CM, and Wright LK (October, 2011). Why Students Don’t Understand Meiosis: An analysis of undergraduate textbooks. 12th International Congress of Human Genetics. Montreal, Canada. Bliss E. Rubin K, Newman D, Evans K, Pelz J. (August, 2011) Creating High Resolution Images for Enhanced Understanding of Biological Organisms. Rochester Academy of Science 38th Annual Fall Scientific Paper Session. Rochester, NY. Catavero CM, Wright LK, Newman DL (November, 2011). Faculty and Textbook Assumptions of Student Knowledge that May Affect Learning the Concepts of Meiosis. Rochester Academy of Science 38th Annual Fall Scientific Paper Session. Rochester, NY. Newman DL, Catavero CM, and Wright LK (July, 2011). Why Undergraduate Biology Majors Miss the Concept of Homologous Chromosomes. Society for the Advancement of Biology Education Research. Minneapolis, MN. Newman DL, Catavero CM, Wright LK (July, 2011). Your students don’t know the first thing about meiosis! American Society of Microbiology Conference for Undergraduate Educators. Baltimore, MD. Wright LK, Newman DL (2011). Student-driven Modeling Exercise Reveals Gaps in Knowledge and Reasoning about Chromosome Structure and Behavior. American Society of Microbiology Conference for Undergraduate Educators. Baltimore, MD. Franklin, SV, Newman DL, Maggelakis S (2011). Developing an Interdepartmental Discipline-Based Educational Research (DBER) Group. Association of American Colleges & Universities Meeting: Engaged STEM Learning: From Promising to Pervasive Practices. Miami, FL. Newman DL, Wright LK, Sweet HC (November, 2010). A structured undergraduate research program that trains and prepares students for post-graduate education and scientific careers. 3rd International Conference of Education, Research and Innovation. Madrid, Spain.